"A comedy about losing your heart, finding your inner child and meeting the one friend you've always tried to avoid." A young orphan has more than just family problems; he has an imaginary friend named Bogus. 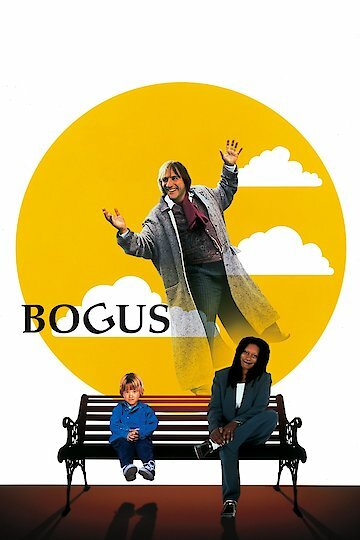 Though imaginary to everyone else, the young boy is the only person that can see Bogus. This creates trouble because Bogus does stupid things to people when this young boy is picked on. Things heat-up as the boy is taken in by his grandmother. Through the boy, this imaginary character drives the grandmother crazy. The grandmother is ready to give the boy back because she cannot take anymore of what has been going on. Just then, Bogus reveals himself to the grandmother and she is shocked. She apologizes to her grandson because she considered him a liar all along. She cannot believe that this imaginary man is no imaginary man. The young boy, his grandmother and Bogus are able to move forward because they have a new belief system that only they are able to understand. Bogus is currently available to watch and stream, download, buy on demand at Netflix, Amazon, Vudu, Google Play, FandangoNow, iTunes, YouTube VOD online.